If you are ignoring Google+, you are making a HUGE mistake. Google+ feels weird if you are used to Facebook. Google+ is a lot of fun! I’m going to explain my reason for conclusion #1 by telling you a little story. About five weeks ago my older sister called me to catch up. During our conversation, she asked me how I liked my new job at Rival IQ and if I was working on anything exciting. I told her I was on a mission to learn all I could about Google+ in a matter of a few weeks – and she responded with: “Why are you learning about Google+? Nobody cares about Google+. It was such a huge failure”. And this my friends is why you should not be ignoring Google+. Google+ was not a huge failure, maybe it’s safe to say it’s a little late to the game, but certainly not a failure. It is invaluable to your business for a number of reasons (SEO being a key one) that I will touch more on a little later – but much like my sister is not yet aware of this, so are the majority of your competitors. The fact is, whether people want to believe it or not, Google+ is coming like a freight train – and I don’t know about you, but I would rather be on the train than be hit by it. Before I get too ahead of myself, I want to discuss some of the benefits of Google+. One benefit (that is relatively time sensitive) is the small number of active users on Google+. While this may seem like a downside, it actually gives all of the current active users an advantage because it is much easier to get recognized when there is less competition. Making waves on Facebook is much more of a challenge because everyone and their mother is on Facebook – with Google+ growing everyday, it’s important to build a following before the numbers start working against us. The early bird gets the worm – so go get yourself some Google+ worm! So there you have it, an SEO strategy that won’t cost you a single cent! In my humble opinion, the SEO benefits alone are enough to convince the most skeptical of Google+ skeptics. At this point, you may be starting to recognize the importance of leveraging the power of Google+ for your business but you are not sure where to get started. So without further ado, I bring you the five steps you should be taking to get rolling on Google+. It’s time to create your Google+ profile so head on over to plus.google.com and let’s get this party started! Once you finish all the “busy work” that comes with creating any new account (terms of agreement, passwords, etc. ), you’ll finally get to see your brand spanking new Google+ page. The very first thing you want to do is add a profile picture and banner to your page. The goal here is to personalize your page and make it visually appealing. It’s sort of like window shopping – people don’t walk into the stores with ugly window displays. Make sure you personalize your page with a profile picture and a banner. The goal is to make your page visually appealing. 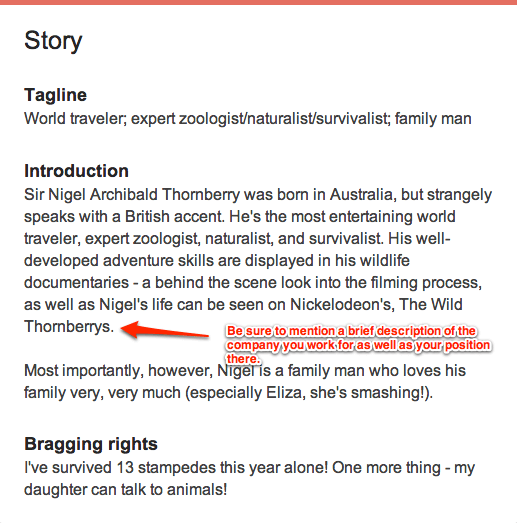 Next, you need to completely fill out all your information in the “about me” section (no shortcuts here!). Most of this is pretty straightforward and does not need an explanation, but there are a few important things you should to take into consideration. First, make sure your tagline includes keywords that paint a complete picture of who you are. You can then expand on these keywords in the intro section where you have room to go into more detail about your hobbies and interests. The most important thing to remember when filling in the intro section is to give a brief description of the company you work for, your position/responsibilities, and a link to the website. When you start engaging and interacting with people on G+ (which we will get to a little later), most of the traffic on the “about” section of your profile will be in the intro section. Simply mentioning the company in this section will therefore increase the likelihood of bringing traffic to both your company’s website and Google+ brand page. It’s important to mention the company you work for as well as a brief description of your position in the company in the intro section. Also, if you contribute to your company’s blog, make sure you link to it in the “additional links” section along with all of your other social media accounts. This is VERY important when considering rel=”author” in search. Rel=”author” is a markup code used in Google’s authorship program. It is suggested that rel=”author” allows authors to rank higher in search results. I strongly encourage you to check out Kevin Getch’s post explaining the many benefits of implementing rel=”author”, which you can read about here. If there is one thing to remember, it’s this: the search benefits of Google’s authorship program aren’t applicable if you don’t link to your writing – so make sure you do! Step 2: Fill Up Those Circles! Still confused? For a more in depth review, you can click here for Google’s explanation. Friends: Not surprisingly, you put your friends in this circle. Coworkers: Again, pretty self evident. People Following Me: It’s to add people to your circle who have added you to their circles. Influencers: People who are thought leaders in your space that you hope to cultivate a relationship with. 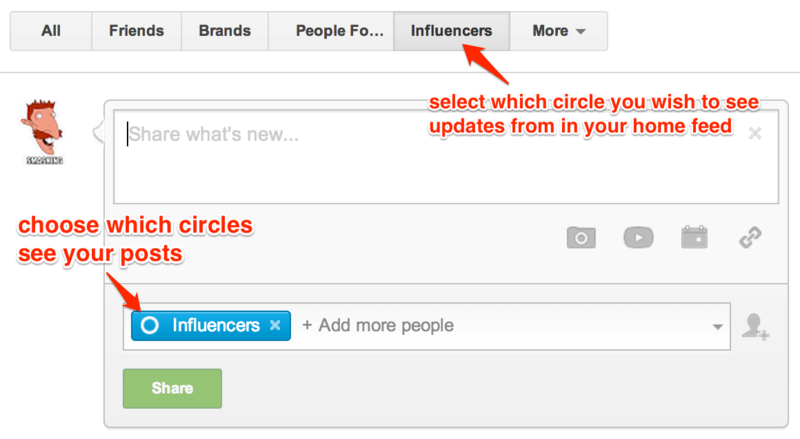 Brands: Put brand pages in this circle. Other: This is where all the random folks without a home go. Having a system for organizing your circles is key. Once all of your circles are organized and named to your liking, it’s time to start adding people to your circles! The very first profile you should add to your circle is your company profile. This will allow you to share content from the company Google+ page as well as +1 (facebook equivalent of “liking”) and comment on posts. Next step is to add your friends and coworkers, this is easy and doesn’t require much thought – simply search for their names in the search bar, click “follow”, and choose the circle you want to put them in. The more challenging task is finding influencers to add to your circles – but don’t worry, it’s not too daunting of a task and can be done in three easy steps. Go to those influencers’ pages and see whose content they are resharing. Add those people to your circles (if your influencer considers a person to be an influencer, then you should at least look into following them). Google+, like Facebook, has the potential to be a bit “noisy” – but, thanks to the people at Google, circles allow you to filter out that noise. For example: lets say you want your visit to Google+ to be strictly about learning from your influencers. Then to only see posts from your influencers in your home screen, all you have to do is select “Influencers” under circles you wish to view. Likewise, if you only want one of your posts to be visible to your influencers, you select “influencers” in the posting options. This is why having a good system for organizing your circles (and actually having people in those circles) is key. Having a good system for organizing your circles makes it easy to filter out the updates you see in your newsfeed as well as which circles see your posts. Congratulations. At this point you have completed the two most lengthy parts of getting started on Google+: creating your profile and adding people to your circles. From here on out things are a lot more simple and much less time consuming, I pinky swear. Now that you’ve set up and organized your Google+ account, you’re ready to move on to bigger and better things – getting involved and engaging with other Google+ users in your space. From experimenting and playing around on Google+, I’ve found that the easiest way to get involved, develop rich relationships, and build a following is through communities (Google+’s version of forums). I think it’s best to start small in the beginning and only join 2-3 communities, as they have the potential to get overwhelming. With the thousands of communities on Google+, it’s difficult to know where to start and what communities to join. The main thing to think about is joining a community that will have interest in what your company has to offer. Also, keep in mind that you want to join a community you are able to contribute to by answering questions and posting relevant content. Do a simple search for a community by topic: If your field of expertise is SEO, then search for SEO – be warned: with a popular topic like this, tons of communities are going to pop up. From my experience, the communities that yield the most engagement are mid size communities (less than 5000 people) that are active (at least 10-15 new posts a day). See what communities are suggested for you: Google+ will recommend communities based on who you have in your circles (which is why it’s so important to do a great job of finding a good group of influencers). Under some of the suggested communities will be a picture (or pictures) of influencers that are a part of that community – those are communities you want to consider joining. If you get overwhelmed by how many suggestions Google gives you, you can also follow the guidelines used when searching for a community by topic – less than 5000 people and at least 10-15 posts a day. Consider joining communities your influencers are in that have less than 5000 members. Answer two questions: This is a perfect time to show how much of a genius you are. If you feel you can give a good and clear answer to someone’s question, go for it! The key here is to remain engaged – if the person has a follow up question, make sure you return to answer it. Share one great article: Assuming that you already read articles relevant to your occupation, this should take almost no time out of your schedule. If you come across an article that you think is excellent, share it with the community. Again, the key here is to remain engaged in the conversation that follows. Share one of your own posts: The great thing about communities is the sense of community (sorry, I couldn’t help myself on that one). People are so willing to give constructive feedback and read other members’ content. Just make sure you are transparent – a good way to start is: “Hey guys, I just wrote a blog post and would love your feedback”. This is an excellent way to improve your writing in the future, as well as bring traffic to the company blog. And that’s it! That’s all it takes – just four posts a week in the communities. Communities are a really fun place to interact and all members can benefit. You may end up spending much more than twenty minutes a week in the communities simply because they can be fun! Just like there was a weekly “formula” for your activity in the communities, there’s a weekly “formula” for your activity on your own Google+ page. In just four posts a week, you’ll have a better and more successful Google+ page than Android…ok well maybe that’s a bit of a stretch, but you get my point. Comment, +1, and reshare one influencer post: This is important for so many reasons. A) you’re going to be resharing interesting links that your followers will enjoy. B) you will be learning new and useful information from your influencers. C) (which is arguably the most important point), you can engage with influencers and their followers in the comment section. Reshare and +1 one company blog post: Remember, one of the goals here is to get people to the company Google+ brand page – therefore you need to make sure to share a company blog post! 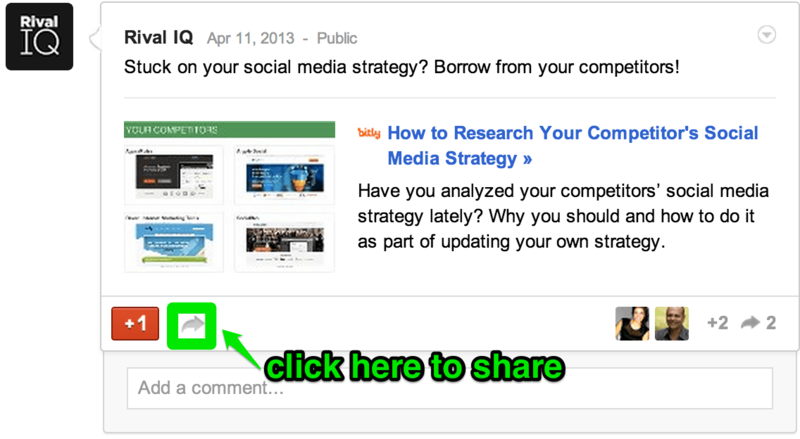 Be sure you are sharing your company’s Google+ post and not linking directly to the company blog. You can find the “share” button (a little arrow) at the bottom of a post. 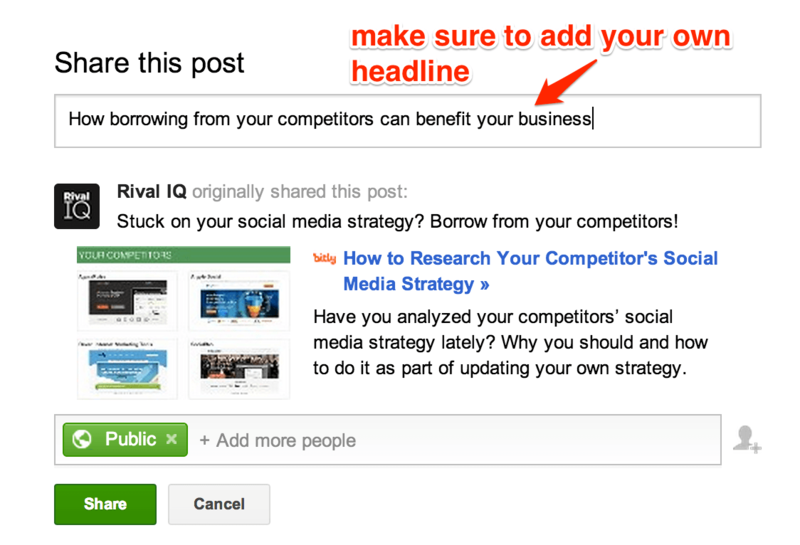 It’s important to share the company’s Google+ post because sharing and +1ing posts yields better search results. Go to your company’s Google+ brand page and click on the arrow botton at the bottom of a post to “reshare” it.This will prompt a new screen to pop up where you can add your own title to the post and choose which circles will be able to see the post when you reshare it. It’s important to personalize the post by adding your own title – so be sure not to forget to do that step. Be sure to personalize the shared post by adding your own title. Post one media rich post: Every experiment/study/analysis – whatever you want to call it – pretty clearly suggests that media rich posts get the most engagement. People love videos, pictures, infographics, cartoons, etc – we just eat that stuff up. Use media to your advantage (just be sure the content is relevant and you’re not posting random gifs for the sake of getting a lot of reshares. That can be annoying and ultimately waste your circle members’ time). Post one personal post: Be yourself. Google+ helps people or companies find others with similar interests – its purpose is not to simply be a billboard for your company. As a marketer, you want to get the word out about your product, but ultimately your product needs to be something that you truly believe will benefit your consumers. Once your product is recognized, if it is good it will sell itself. You are not a robot and you need keep the “human touch” to your page. Always be sincere, honest, and unafraid to hide your personal interests. Remember, the benefit of using resources like Google+ is not solely to advertise your company, but to reach out to those that could benefit from your product and most importantly to be a community member. When I initially started following the four previous steps, Google+ felt like a chore: something that I didn’t want to do, yet was necessary. But to my pleasant surprise, the more I got involved in the Google+ community, the more I enjoyed it. There are so many interesting people that you have access to where you wouldn’t have had otherwise. And the best part? These people are generally more than willing to share their knowledge, give their opinions when you ask for them, and answer your questions. The best advice I can give you is this: whatever you put into Google+ is what you get out of it – and believe me, there is a lot to be gained from Google+. You are now well on your way to leveraging Google+. Let’s do a quick “review session” to make sure everything we covered really sinks in. Have fun and strive to be a part of the Google+ community! What have you found to be the biggest challenge when getting involved in the Google+ community? And what have you found to be the best way to overcome these challenges? Be sure to share in the comments below! Danielle is a digital marketing expert. She is always searching for or helping others learn the latest tips and tricks to improving social media, content marketing and other digital areas. When she's not working, she likes to spend her time keeping up to date on pop culture, getting her yoga on, and obsessing over how awesome the 90s were. You can find her on Twitter, @Danielle_Prager , and on Google+.